There is a recurring frustration among observers of the Trump administration that commentary easily becomes distracted. Stories about the Trump family’s everyday nepotism and corruption may be important in the context of a so-called ‘normal’ presidency, but these are small marbles when compared to the administration’s catastrophic performance at Helsinki or the odious policy of child separation. 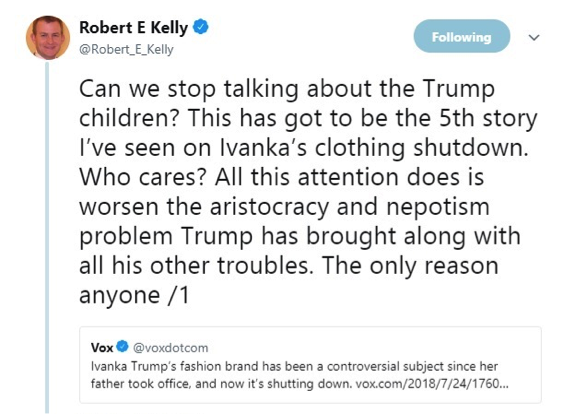 For many IR scholars the message is clear: don’t focus on Ivanka’s clothing line, focus on what matters. But what if stories like the decline of Ivanka’s clothing brand matter more than we think? In isolation, these kinds of stories appear as inconsequential distractions. Taken together, they form a broader genre of reporting focused on the rising personal costs of serving under Trump. This genre of reporting is important because it points to two crucial political processes occurring around the Trump administration right at this moment: backlash and stigmatization. I want to suggest that scholars should not only think about how these processes are significant features of contemporary politics, but how they can inform how we think about restraint in the age of Trump. The idea of a backlash carries connotations of a reactionary and hostile mode of politics. For most of IR, the concept is conspicuously absent, in part because the field has largely ignored reactionary politics in general (see Mackay and LaRoche’s take on this problem). In Susan Faludi’s seminal study she describes backlash against feminist politics in the United States during the 1980s as a “powerful counterassault on women’s rights… triggered by the perception—accurate or not—that women are making great strides” in society. While individuals can occupy privileged positions in backlash movements, its force was derived from how its reactionary politics diffused across a variety of strata in popular culture in movies, magazines and television. Hostility to women’s rights was simultaneously everywhere and nowhere in particular. Described in more generic terms, a backlash signals a visceral and reactionary episode where political claims are adamantly rejected, speakers are rebuked, and an issue becomes intensely controversial. These episodes can be politically significant for a number of reasons. They can mobilize new or latent social movements. They can create unexpected coalitions. They can shift debates to new discursive arenas. But most importantly here, a backlash can be a powerful source of social stigma. While Goffman’s views on stigma overlap with the contemporary literature on shaming and transnational advocacy (for examples see Risse & Sikkink, Busby & Greenhill, and Murdie & Davis), it also differs in key ways. First, while the shaming literature often focuses on how transnational advocacy groups pressure governments, Goffman was far more concerned about how stigma accrues around individuals and affects their personal lives. Second, where as shaming is widely treated as a rhetorical maneuver Goffman was at pains to stress how a social stigma can be a crippling social, political, and economic liability. From being excluded from valuable networks of patronage, to being professionally blacklisted, the effects of a social stigma can be severe. Finally, constructivist models of shaming typically involve some form of identity conflict. As Risse & Sikkink write in their 1999 book, activists work to convince “leaders that their behaviour is inconsistent with the identity to which they aspire”. But as Goffman avers, an individual need not identify with the values represented by a stigma for it be effective in shaping behaviour. We can disagree with a stigma and still work to conceal it out of fear of social ostracism. The interplay between stigma and backlash offers a compelling picture of the Trump administration. Facing backlash on policies from child separation to submissiveness on Russia, members of the administration have become increasingly stigmatized. Individually, stories about Allan Dershowitz not being invited to dinners, Kirstjen Nielsen and Stephen Miller being heckled at restaurants, Sarah Huckabee Saunders being refused service, Ivanka Trump’s clothing brand tanking, and even young Trump staffers not being able to get dates don’t add up to very much. Together, they point to a broader pattern of professional and social stigmatization. The inclusion of Dershowitz in this list is intentional. He may not formally work for the administration, but even working as an arms-length advisor can be perceived as “deeply discrediting” and thus a marker of a “spoiled identity”. This is a crucial structural feature of backlash politics. Because it is an intensely emotional phenomena, it’s prone to what Hall and Ross call “spillover effects”. In these situations “strong felt reactions generated by one event or object color behavior toward unrelated stimuli by virtue of superficial resemblance or the timing of exposure”. Or, as the astute theorist of public opinion Walter Lippman once argued: “Emotion is a stream of molten lava which catches and imbeds whatever it touches. When you excavate in it you find. . . all sorts of objects ludicrously entangled in each other”. Anger directed at those responsible for child separation—such as Trump, Nielsen, and Sessions—can spillover to more marginal actors. So why does this matter for IR? It matters because one of the acute concerns for IR types is the problem of restraint: how do we convince empowered political actors to exercise restraint when making complex and consequential decisions? There is a lengthy list of reasons why restraint in foreign policy and national security is desirable (for a sampling of the discussion see Thrall & Friedman, Schou Tjalve, and Steele). Sometimes it’s because a policy is poorly conceived or may have unintended consequences. In other cases it may lead to the violation of human rights, greater instability, exorbitant costs, or lasting damage to international alliances or institutions. Or it might just kill a lot of people. The challenge for IR is that there is vanishing little evidence anyone in the Trump administration cares about these issues. Administration officials were warned, for example, about the traumatic effects of separating migrant families but proceeded regardless in order to achieve the desired deterrent effect of the policy. A more effective way of appealing for restraint in the age of Trump may be as a strategy to avoid backlash. Here restraint appears as a move to protect one’s ‘brand’ against the identity-spoiling effects of backlash politics. Moderation of extremist policies doesn’t emerge out of a deeper fidelity to human rights, the national interest, or some ideal of public service. Instead, it becomes entirely self-interested move to avoid the social stigma that might permanently tarnish one’s career. To an extent we can already see the dynamics of this stigma at play: the White House is struggling to fill positions and former staff are being shunned by prospective employers. The task for scholars is to better understand the dynamics of stigmatization and how they can be leveraged in a more effective appeal for restraint where conventional institutions have failed. No reading list is perfectly inclusive. Here’s one small step I’ve learned to address that. Is part of the problem confusion over genre or context in constructing the problem? Rather than thinking about struggles over policy (where rational thought, doxa, and path dependency play a role), maybe we should be thinking more in terms of how tabloid and reality TV produce plebiscites around national identity. You are right to point to some situations demonstrating the spoiled identity of working in the Trump administration. But is it a spoiled identity in all contexts throughout the various counter publics that push up against a broader notion of the public? In the space of the tabloid or reality show, is there not some place for foolery that does not spoil an identity?